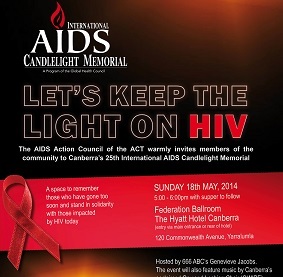 The AIDS Action Council of the ACT is proud to bring you Canberra’s 25th International AIDS Candlelight Memorial. A space to remember those who have gone too soon and recommit to continuing more than 30 years of international HIV activism, so the grief and stigma faced in the past is not something we must face in the future. Hosted by 666 ABC’s Genevieve Jacobs, the event will also feature songs by Canberra’s acclaimed Gay & Lesbian Qwire and Johnathan Davis, personal tributes and a candle lighting ceremony. Guest speakers include US Ambassador to Australia John Berry and local Community Advocate Sally Richards. We would also like to thank our supporters of the Canberra International AIDS Candlelight Memorial for their generosity of time, effort and resources: Hyatt Hotel Canberra, Staging Connections, The Canberra Gay & Lesbian Qwire and the ACT Health.